Please note: I am taking a sabbatical from school visits Jan. 2019 to the end of the 2019-2020 school year. I will still be available for conferences and conventions. Just e-mail me to inquire. I read aloud from my published books, talk about where some of my story ideas have come from, and use masks to engage children in acting out one of my stories. I talk about where some of my story ideas have come from, read aloud from two of my books, tell a bit about my series chapter books, and share examples of the revision process. I talk about how I became a writer and explain a bit about my writing process and the ideas that gave rise to my books. I also talk about what it’s like to co-write series with long-time co-author, Joan Holub. Virtual visits are an affordable way to connect with an author when an in-person visit just isn’t possible. 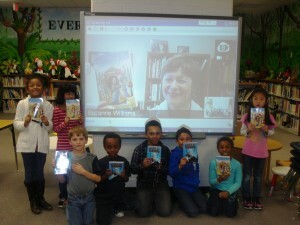 I have skyped with classrooms all over the U.S. and even internationally. My fee is $125 per half hour video skype session. You can email me to inquire. If students buy books before our virtual visit, I can autograph transparent bookplates to mail out if you send me the names. I enjoy speaking at conferences. I have been a keynote speaker or featured speaker at many educational conferences for teachers and librarians, and have spoken at writing conferences as well. If you are interested in having me speak at a conference, please email me to inquire. Please note that I am taking a sabbatical from school visits Jan. 2019 through the 2019-2020 school year. To reserve your school visit date(s) on my calendar, send me an email confirming the agreed upon date(s) and fee. That’s all I require in the way of a contract. If an invoice or other paperwork is required by your school district or PTSA please let me know in advance and send me any forms I need to fill out so I may be paid on the day of the visit. 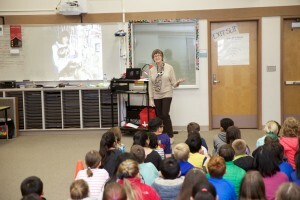 I’ve found that school visits are most successful when students are familiar with my books. Ideally, students should read (or have read aloud to them), at least two of my books prior to my visit. I’ve also posted information below on how to order my books. I will do three (3) presentations per day* plus autographing (if you choose to sell books). Large assemblies are fine. Please allow 10-15 minutes between presentations for set-up as you compose a schedule. *If you have half-day kindergartners who aren’t at school during a primary assembly time, I’m willing to add a short fourth (20 – 25 minute) session to accommodate them. Send me a copy of the day’s 3-presentation schedule. Please have the room where I’ll be speaking set up and ready to go. I’ll plan to arrive at least twenty to thirty minutes before the first assembly is scheduled to start. (Point to table displaying my books): We are pleased to have the author of all these books here with us today. Most of you have had the opportunity to read or hear her books during the last several weeks. Today you’ll find out how she came to write some of her stories, and a bit about her life as a writer. Please show her what terrific listeners you are as we welcome Suzanne Williams. With large groups I prefer that students sit on the floor, with chairs around the periphery for teachers and other adults. For assembly presentations it’s nice to be introduced to students before I speak–it gets them ready to listen. Please provide me with a lunch, allowing a one-hour lunch break if possible. If time permits, a visit to a nearby restaurant is nice, but if there’s no place close by, a fast-food type sandwich (or bagel with cream cheese) is fine. I love being a part of special staff luncheons, but I’m not fond of cafeteria food! I love autographing books, and can sign during breaks in the day and after school as needed (as long as my schedule allows). Please have names to whom books are to be autographed clearly written on stickies attached to each book. I can also sign adhesive book plates to leave behind for any “late” sales. In addition, I will bring a master sheet of an autographed bookmark that can be copied and distributed to students who would like one; please encourage students to not ask me to sign slips of paper. Usually my in-print books can be supplied through a local children’s bookseller. Sometimes (ask!) local booksellers will even help with sales at a school before or during an author visit. Most offer a 20% discount off the cover price. If my books are not in the store, the bookseller should still be able to order them for you–given a few weeks advance notice. To find local, independent bookstores in your area go to IndieBound. Amazon and Barnes & Noble have nearly all my books, even the ones that are out of stock or out of print at my publishers. These on-line bookstores can usually deliver books by mail within a few days. To find out what they have, do a search on “Williams, Suzanne.” You’ll want to cross-check the titles that come up against my list of books before you order, however, since Suzanne Morgan Williams also writes for children. All of my published books are fiction. If you have enough lead time, you can order books directly from publishers and receive a 40% discount. Tell the customer service/promotions person that you are ordering books for a school author visit, and the date of the visit. Allow at least six weeks for delivery. You should be able to return unsold copies to the publisher. 3 – ISBN(s) for the book(s) you would like to order 4 – Quantity you need. If you already have a Scholastic account, please let the rep know. Otherwise, you will need to pre-pay for the books with a credit card. If you don’t want to pay via credit card you can submit paperwork to set up a “Retailer Account”. call Penguin/Putnam at 1-800-526-0275 and ask for the Author Appearance Desk. To order titles from the Goddess Girls series, Thunder Girls series, Heroes in Training series, or Little Goddess Girls series (all with Aladdin): 1-800-976-1726 or 1-877-989-0009. More info about author appearance orders can be found at this link. Titles in the Princess Power or Fairy Blossoms series are available through online bookstores or Harper Collins as e-books. I offer a 10% discount on my speaking fee for three or more (consecutive) days of visits in one area. Please contact me for conference fee information.